The team goes on two missions, while their leader fights to retain control of her project in New Suicide Squad Volume 1: Pure Insanity. So the Suicide Squad is doing its crazy thing, but apparently someone's decided that it needs a bit more oversight than it has traditionally had. Enter Victor Sage, a by-the-books kind of guy, designated to lead the Suicide Squad alongside Waller, and keep tabs on their actions. Understandably, this transition doesn't go so well, but the missions go on. Initially, the Squad heads into Russia. Sage thinks it's an awesome idea to cause rivalry within the team, in an effort to 'spice things up.' Which goes about as well as can be expected. But they do end up finding out what the Russians have been working on...by running headfirst into it. And we are reminded once again exactly how disposable the Squad members are. Later, what's left of the team picks up a few replacement members and heads off to China. While the brainwashed ninja man-bats distract the guards at a secured facility, and Reverse Flash sets up enough bombs to blow the place sky-high, Black Manta and Harley check out what exactly is going on there. Looks like China's working on the supervillain threat as well. With similarly astonishing results. There's a lot going on in this book. With the ever-revolving team members, who by definition don't play well with authority, there's going to be power struggles. Black Manta can only do so much as an on-site team leader, when it's a crapshoot whether he can get anyone to actually listen to him. Waller understands this, but it's hard to make an outsider understand what allowances have to be made for such an...eclectic team. I also have to make the standard objection to how they've changed Waller's looks. Not every important female has to be slim and pretty. It was nice to see a woman in power who had better things to worry about than her diet, but alas, that's once again gone to the wayside. 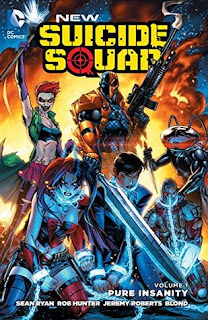 In all, New Suicide Squad Volume 1: Pure Insanity is a pretty decent jumping-off point for new fans to the franchise. Fans who have come to it from the Arrow TV show references have enough touchstones with Deadshot and Deathstroke to not be too lost, while still building towards what will probably be future storylines. Highs: Both the Russian and Chinese approaches to the supervillain threat are fascinating, and I hope future stories go into these further. Lows: Between pitting the two female Squad members against each other, and Waller's 'makeover,' this isn't exactly the most feminist-friendly book out there. Verdict: While not a perfect comic by any means, New Suicide Squad Volume 1: Pure Insanity still has lots going for it. One last romp through London - and beyond - with the Hadrians. “The Gaslight Chronicles” are finally brought to a close in Cindy Spencer Pape's Ether and Elephants. Note: Dragons & Dirigibles is the seventh story of the Gaslight Chronicles series. While the stories work well as stand-alones, there are inherent spoilers, especially where the romances are involved. 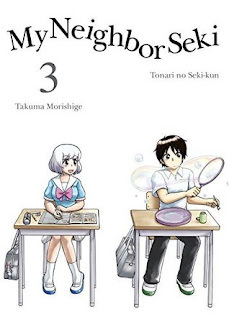 Yokoi starts really getting involved in Seki's...projects...in My Neighbor Seki Volume 3. Note: My Neighbor Seki Volume 3 is part of an ongoing series. 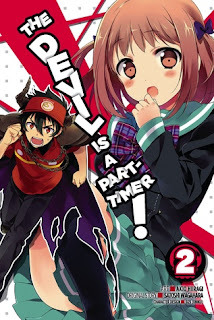 Check out the review of Volume 1 here, and Volume 2 here. Otherwise, read on!